UPDATE: Tropical Storm Risk (TSR) just downgraded it from a category 5 (maximum) to a category 4. Peak winds at 115 kts or 130 mph. It is projected to still be a category 4 when it hits Tokyo. We just closed our storm doors and gathered our candles. "If it continues to move as projected, it will be of the most powerful category among typhoons that have landed on eastern Japan in the past 10 years or so," an agency official said, warning of heavy rains, strong winds, mudslides and sea surges. 16:51 JST: 1331 homes have been evacuated in my prefecture, Chiba. Several hundred homes have been evacuated in Sakura, the next town over. 17:20 JST: 108,000 locations have lost power in Shizuoka. 17:43 JST: Lost power for a minute but it's back up again. My PHS wireless network card shows no network. 16:32 JST: Feels like it's over. That wasn't bad. I guess it's really the flooding that's causing damage. I guess we were lucky. Sorry to worry anyone. 18:50 JST: Chiba is warned that there may be some fukikaeshi or "blow back" still. I was going to say that closing the storm doors sounded like a good idea. TSR says it's category 2 now. I'm in Kanazawa. A bit noisy but nothing like the monster super-storm I was expecting. Yeah. I think it lost a lot of power when it got closer to us. 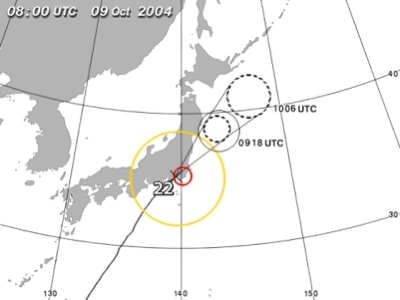 I think Shizuoka got hit pretty hard, but not nearly as bad as they expected I think. I got sound on the movie -- thought it pretty impressive! Sounds like a real rush! The updated play-by-play is awesome. Love the video. Isn't that a scene from Kurosawa's "Throne of Blood"? Listed below are links to blogs that reference this entry: Direct hit coming from super typhoon Ma-On. Joi Ito - "Direct hit coming from super typhoon Ma-On" by Joi Ito is licensed under a Creative Commons Attribution 4.0 International License.